"Let's blow away the rest of Europe," the former United midfielder added.In January, 48,121 attended Athletic Bilbao's cup game against Atletico at the San Mames Stadium.A week after the record was set at the Wanda Metropolitano in March, 39,000 watched Juventus beat Fiorentina at the Allianz Stadium. But Neville - whose Lionesses play Canada at Manchester City's Academy Stadium on Friday in the first of four home World Cup warm-up matches - believes women's football in England has "more sustainability". "Looking at the attendances in our league [on Sunday], I actually think that's better than the one-off games in Spain or Italy," he said. "There was 2,800 at Kingsmeadow [where Chelsea beat West Ham], 1,500 at Solihull [where Birmingham lost to Arsenal]. I think we've got a good foundation. "I see games in Spain where there's probably only 100 to 150 people watching. So I think as a base line, we've got probably a little bit more sustainability. "What I would say is that some of the big teams in England now have got to open their big stadiums and fill it. I think our game in this country is at a far better place than what it is in Spain and Italy. "I think now, if (second-tier leaders) Man United win the league, or [top-flight leaders] Arsenal - throw open your stadium, open it up. Champions League game for Chelsea - why not play it at Stamford Bridge? Get 30 or 40,000. 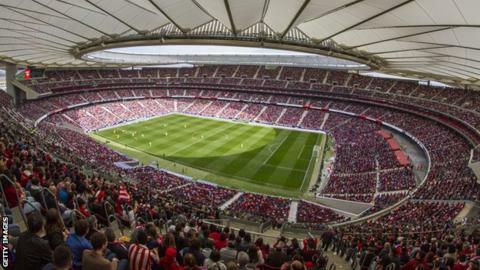 "The largest English crowd in the modern era was 45,423 for last season's FA Cup final between Chelsea and Arsenal, while the largest crowd to watch a Women's Super League game in England is 5,052 when Arsenal and Chelsea met at the Emirates in April 2012.The outright record attendance for a women's game is 90,185 at the 1999 World Cup Final between the USA and China, held at the Rose Bowl in California. In March, up to 50 Paris St-Germain fans were denied entry into their Champions League match at Chelsea when weapons - including knuckledusters, fireworks and drugs - were found on a supporters' coach.There were also reports of vandalism at Kingsmeadow as well as disorder at Waterloo and Wimbledon stations before the quarter-final first leg.But while not condoning the actions of the PSG fans, Neville believes the "kerfuffle" shows the women's game is "going places". "I know it wasn't a nice thing, but you know, that little thing - 'actually this is important now'," he said. "We don't want any of the rubbish but what I'm saying is it is a sign people aren't turning up for a women's game now just to sample the chips and bring the kids, they're actually coming because they want their team to win badly." » Wimbledon 2018: How many multiple singles champions can you name?